If you haven't realized it by now, I love T-shirts! I wear them around the house on a daily bases and occasionally outside. I also love to wear band T-shirts to concerts and team T-shirts to games. What could be better than a great T-shirt? A great Custom T-shirt that you created yourself! That is where Fibers comes in. Fibers is an awesome innovated company that allows you to choose from one of their designs, or create your own. They have T-shirts, Hoodies and even Baby Clothes. If you don't want to design your own shirt, you can check out one of their designs. They have a really great selection of Vintage T-shirts that I adore. I am a child of the Eighties and I have always loved the "worn" look that these shirts have. Or, you can add the vintage look to your own design. I was provided with a gift certificate to choose my own shirt and design. I decided to go with the cheapest T-shirt that they had and to really expand on my design. It was super easy to design your own shirt using their website. You click on the create page and it takes you into your options. You first get to choose from 43 options which product you want to use. I choose the Men's T-shirt (base price $15.99). Then, you can decide on if you want to use one of the 37 Templates Fibers has. These templates are great if you want a personalized look, but aren't very creative. A lot of these are name based templates to add your (or your loved ones) name to a shirt design. I choose to create my own design and skin the templates. The next feature you can add to your T-shirt is images. Fibers has over 7,000 clip art images you can use! I love this and had a blast going through all of the images. I literally came up with enough ideas to make dozens of shirts just by browsing through these images. You can also choose to upload your own images. I think I am going to make some really cool T-shirts for our parents when we have our first child using the baby's picture. I definitely used images on my T-shirt, but we will get to that in a little bit. Next on the Fibers website is Type. You can choose from a vast amount of fonts. Once you have your font and your words picked, you can arrange them wherever you want on the shirt. It gives you printing guidelines. You can also adjust the type, make it bold or italic and choose effects (such as curving the text). After text you come to drawing. This is the one part of the website that I had a problem with. My computer froze on me when I tried to use the drawing tool. I am not sure if it is my computer, or their website. I did try it twice and had no luck. This is fine with me because I am awful at drawing on computer screens. The final feature that you can add to your shirt on the Fibers website is the "Design Effects". This is a tool that makes your shirt looked distressed or vintage. This gives it that cool Eighties look that I talked about earlier. You can also choose to use all these tools to design the back of your shirt if you would like. 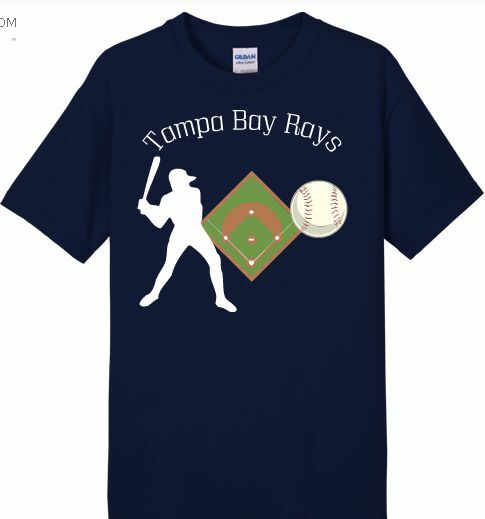 The first shirt that I designed for fun is the Tampa Bay Rays shirt (my baseball team). This shirt used 3 images from Fibers clip art and some type. I also did a back to this shirt, but I forgot to take a picture of it. I had Pena with a 23 underneath of it for Carlos Pena. This shirt was super simple and easy to do. It only took me about 3 minutes to design. I also should mention that the image of the baseball man was originally black. You can change the color of the images also! The second shirt is my baby. I absolutely love this shirt!! I went to a recent concert in Orlando, FL to go see 30 Seconds to Mars and decided to use those pictures to make a shirt. To avoid infringing copyright laws, I did not use any band images or photos not taken by myself. I put the bands name on the front with two pictures of Jared Leto (the lead singer) from the concert. 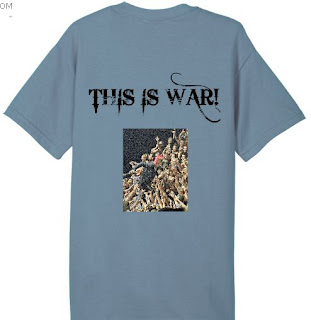 On the back I put "This is War!" which is the current band "theme" and the name of their latest Cd's and one of my favorite songs. 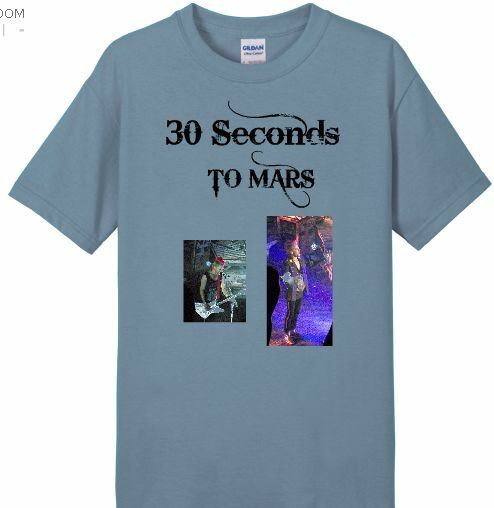 I also put a picture of Jared Leto when he was in the crowd on the back of the shirt. Really, it is a very simple design, but I love it! So, here is the break down on prices. I kind of went a little over the top with this one, but generally you can get a shirt with shipping from Fibers for about $20-$25. Awesome deal for a personalized shirt! Like I said, I went all out on this shirt, so yours would probably be cheaper. I thought all the prices were reasonable except the $5.00 charge for a colored shirt. That was a little high, but since everything else is so cheap it balances out. It was also great that they didn't charge per image like I have seen other companies do. You can add as much or as little to the front of the shirt without an extra cost. The T-shirt itself is also really well made. It is soft and the perfect thickness. I ordered a 2XL and it is unfortunately HUGE on me. I was hesitant to order a XL since some T-shirt companies run small, so I went with a bigger size. If you order from Fibers, order your normal size. The T-shirt is 100% cotton, but it is pre-shrunk. I am going to wear my shirt to bed for now and hope that it still shrinks a little. I still love the shirt though! So, if you are looking for a great gift, if you want to spoil yourself a little or even if you want to make a shirt for your group, visit Fibers.